If the header did not quite catch your the breadth of your imagination, let me put it simply: P-NUT or Personal-Neo Urban Transport is the what the R&D at Honda labs have to offer you. This concept car is way off to hit the roads. Looks cute, for the “small family”; ideal for the traffic burdened road– yet it is still the “concept” car for the future. Why? A probable answer for the business-mind is actually the question:,”Are there any takers for this cuty-pie, because this “cuty-pie feeling” has to generate revenue figures in terms of bringing business, if not– there is no point in these sitting in showrooms with window-shoppers to look at. This is just a simple and way too myopic view of the actual reasons, but still, is a contributor for this still being in R&D labs. 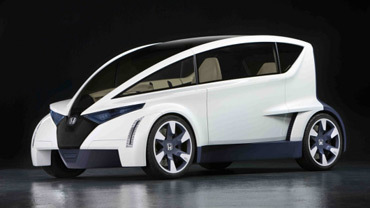 Do share your thoughts as to why you think this baby “Developed by The Advanced Design Studio of Honda R&D Americas, Inc. in Los Angeles, the P-NUT is currently only a concept with no plans in place to bring it into production” ? This entry was posted in Business, Businessweek, Honda, P-NUT. Bookmark the permalink.